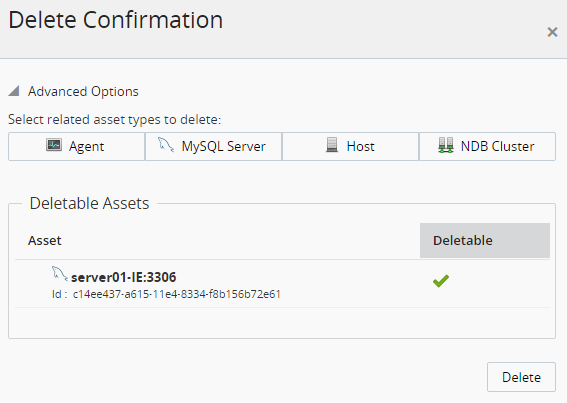 This section describes how to delete assets, and groups of assets, from MySQL Enterprise Monitor's inventory, from the user interface. Deleting assets from the inventory does not delete or uninstall assets from their installed locations. The delete process removes all record of an asset or group of assets from the internal record of MySQL Enterprise Service Manager, only. This enables you to remove entries for clusters, topologies, agents, hosts, and instances which were monitored, but are no longer in use. For information on deleting assets from the command line, see Section 16.5, “Deleting Assets from the Command Line”. NDB Clusters: Clusters can be deleted in their entirety, or you can delete individual nodes by opening the NDB Cluster details view, and deleting the nodes one at a time. Deleting an NDB API Node also deletes the server. It is not currently possible to delete an entire replication topology. To delete the assets involved in a replication topology, you must delete each individually, or use a related request type where possible. If the user does not have the required permissions. Open the asset's view from the Configuration menu. To delete an MySQL instance from the MySQL Instances view,. select Delete from the instance menu, or select the instance(s) and click the Delete Instances button. 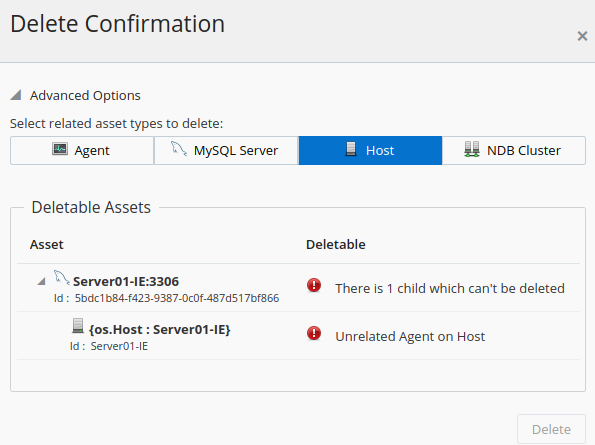 To delete an asset from the asset-specific views, Agents, Hosts, or NDB Clusters, select Delete from the menu on each asset's line or select the asset and click the Delete button. You can also select all assets in the view, using the Select All button, and delete all by clicking the Delete button. The Delete Confirmation dialog is displayed. If it is not possible to delete an asset, a warning is displayed in the Deletable column. To see more information on the nature of the warning, hover the cursor over the warning. A tooltip is displayed. If the asset is deletable, confirm the details are correct and click Delete. A confirmation dialog is displayed. To delete assets related to the selected asset, select one of the other types from the Advanced Options section. If the selection is available, the Deletable Assets section is updated with the asset's details and whether it is deletable. The related host also has an agent installed, which is unrelated to the delete request. The presence of the unrelated agent prevents the removal of the MySQL instance and related host delete request. The Delete button is deactivated.